Ben Clark grew up in Nebraska and now lives in Chicago, where he works as an editor for Muzzle Magazine and Thoughtcrime Press. He has two collections of poetry: if you turn around I will turn around (2015) and Reasons to Leave the Slaughter (2011). 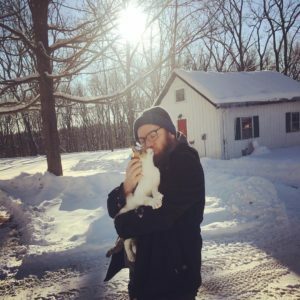 Collaboration has become a major part of his writing practice, and recently he’s been lucky enough to work on projects with Dana McKenna, Josh Gaines, and GennaRose Nethercott. Site and illustrations by Debra Kayes.